See if you have what it takes to escape certain doom in the bonus game! Collect hidden signs and morphing objects. Earn a myriad of unique achievements. Enjoy the souvenir room, music, concept art, and more! 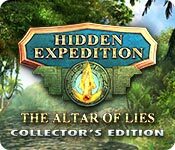 Hidden Expedition: The Altar of Lies Collector's Edition is rated 3.3 out of 5 by 29. Rated 4 out of 5 by yowzasma from I Was Not Disappointed :) 0ne of my very first casual games was Hidden Expedition -Amazon when it was brand new & which I still re-play every year or so. When I saw the title with the jungle background I hoped it would not disappoint and it nearl did but there was just enough jungle scenery to smooth my ruffled feathers. Reading my fellow Fishies positive reviews should give you a very good idea of this games good and not so good points. I am giving this one a **** (4) out of *****(5) stars in my personal enjoy- ability scale' P.S. I have all the " the Hidden Expedition" games but one. Rated 4 out of 5 by RPgames from Sams back? I liked the game it is like the other Hidden Expedition to a point but like some one else said it is a short game unless I got better at these games. Not as exciting as some of the other Hidden Expedition but better than the first couple. Have not finished the bonus game yet. I got this game on sale and hate to say it but I would not buy it at the retail price. Hope the next one is a better. Longer. Rated 4 out of 5 by dancemom1 from Who can you trust? Hello friends! As usual I mostly review on the game play and leave the story line to others, who do a much better job than I. Is this really #15 in this series? The graphics are fairly nice, and usual, blurring in close ups. Game play was very good, with no problems during the demo and the scene fit my large screen quite well. Colors were nice, even though a bit muted in some areas. It did not take away from the game at all. Animation was fairly smooth. The voice overs, although not a lot, are well done and are age and character appropriate. I like that we have pretty much the same main characters in each addition. We did have a few additions this time. Music was nice and moved with whatever was happening at the time. Sound FX are well done and are throughout the game. HOPs are varied and well done. We have highlighted words within a straight HOP list; interactive lists and interactive silhouettes. The scenes are clear and items are not difficult to find. I did not see that you could switch to something else if you didn't care for the HOP. The variety keeps you interested. 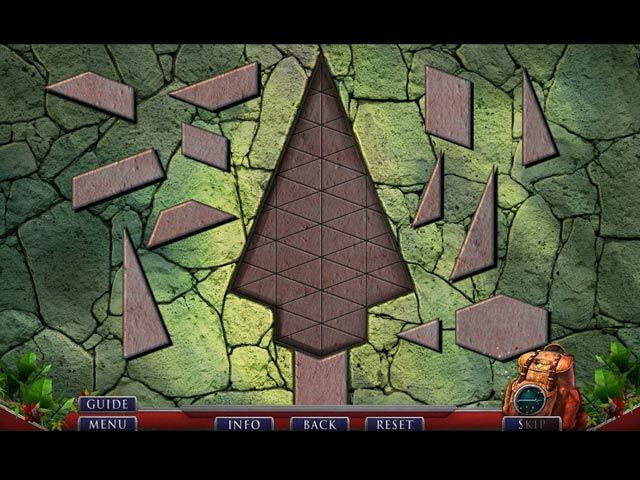 Puzzles were somewhat different, but nothing too difficult to complete. A couple did take a little time and thought. The hint system is very helpful and actually gives you a hint. We also have the transport feature for jumps to longer locations. This is a time saver, and faster than going to the jump map and trying to figure out where you are. Nice collectibles as well. We have to find 12 morphing items in HOPs, which are easy to miss, as they morph in and out in about 7 seconds each. There are 36 hidden Mayan signs that look like chiseled masks. These are fairly large, various colors, and I found them easy to spot. As usual, we also have fact cards that give us information on areas and things within the game. They don't really do anything for the game, just take up more time to read. I don't have all the games in this series, but what I have, I really like. This story is somewhat different than the usual that we have been seeing, and had enough action to keep my interest. It flows well and is easy to follow. There is some challenge to this addition, so you shouldn't get bored. I think all levels of players will find this one interesting. I like this one well enough to add it to my ever growing collection of CE games. I gave this game a 4.5. As always, try it for yourself and see what you think. We all have different tasted in games and you may not care for this one at all. Thanks for the reviews. Play on! Rated 4 out of 5 by twinsoniclab from Mixed Bag Game - demo left me confused, but one great HOS! I had to read other reviews to clear up my confusion! I'm in Honduras. Our team is ambushed, I escape via parachute, landing... uh... I THOUGHT it was a diner at the bottom of the cliff, which was odd... but, I am suddenly in Montana. I didn't know that until the "police" mentioned it, then I run to the "Metro" where I meet a mime. Did I run all the way to French Canada? Since I didn't miss any cut scenes, and I thought I was awake, I can only figure the segue from jungle to Montana was not done well! I blame that, rather than myself, ok? The game itself is beautiful. The lovely jungle colors, the rusted automobiles...in Montana... I love games set in realistic locations, be it the Patuca River in Honduras, or an auto shop in Montana! I also love a game set in modern times, that stays in modern times. Don't get me wrong, I love a good fantasy once in a while, but the real human "bad guy" games are far and few between. That is why I like the HE games, no portals to drippy dungeons or witches with red eyes stealing souls. I don't think the name "Noble Scoundrels" is much of an intimidating name for a gang though! I really have no idea why we jumped up from the diner to chase them either, another plot line left a bit lacking. But, we do, declaring, like Nancy Drew, "That must be the Noble Scoundrels! Let's get them!" Ending up in an auto repair shop, the entire clean the dirty engine bit is a waste of time. So, two parts to the demo, the jungle and Montana. Both are well made, but actually the puzzles and HOS in Montana were better. In fact, that HOS in the toyshop was one tremendously good HOS! One of the best, and longest I've played. I wish we could have been in charge of the "Rube Goldberg" element of it, rather than just finding the pieces. HOS otherwise are varied. Silhouettes open texts where you find the highlighted words (everyone is doing this now, it's not new anymore). Text then silhouettes (or outlines). PUZZLES: twice as many as HOS. Some of the instructions were very confusing, and I skipped. Pick symbols to overlay on partial symbols (easy). Move cursor to keep in crosshairs (stupid). Drag number tiles to others so total 10 (different, and harder). Set arrows on map to avoid H.E.L.P. agents (this is before I knew what was happening and wondered why I was avoiding my own agents!) Rotate cogs to unlock (easy). They missed a chance to give us a puzzle during the carbon dating. We just click and mortars grind and test tubes pour. COLLECTIBLES: 36 signs, 12 morphs in HOS, fact "cards." I thought this series had two collectibles, but it might just be the Smithsonian editions of the series. There is the EIPIX "souvenir room," which I actually look forward to. A small pet peeve. I would expect our supervisor to know the correct word is "anyway," not "anyways!" Will I get the game? Yes. Sale or coupon only, since I want the CE. Rated 3 out of 5 by Elaine101 from SAM Is this an older game? 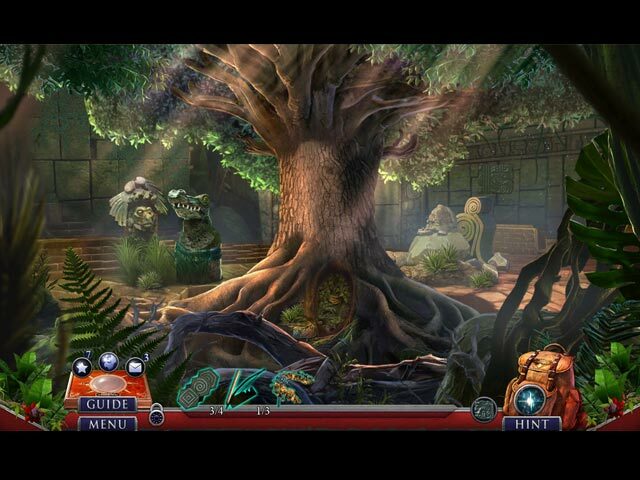 In this one the picture of Sam is the same as in other Hidden Expedition games, but Sam's voice is not the voice in other Hidden Expedition games. Seemed distracting. The game was not the same quality as other Hidden Expedition games. Rated 3 out of 5 by Eddington from Time for a New Chapter? I love the Hidden Expedition series and have played all of the episodes. They are uniformly interesting in terms of the game play. The animation and illustration are both superior to many other games. And so I was really excited to see a new episode. I was disappointed, however, with this episode. It seemed to be a cookie cutter of other episodes without a lot of ingenuity or unique qualities. The story line follows other episodes without adding any new elements and the bonus chapter in the CE seemed exceedingly brief. So all in all I like HE, but it seems time to retire this series for a new chapter of fun elsewhere. Rated 2 out of 5 by LunaNik from Logic was sacrificed on the Altar of Lies. Eipix's immense talent is never brought to bear on game series they've taken over from other developers. When they innovate, they produce amazing games like Amaranthine Voyage: The Shadow of Torment, Off the Record: Linden Shades, and Saga of the Nine Worlds: The Four Stags. This episode of Hidden Expedition is emblematic of choosing quantity rather than quality. The storyline started out with promise, but quickly devolved into confusion without a shred of logic. Instead of exploring the ancient city, we're transported to the modern world without an explanation, and must troll through a diner and an automotive shop. The devious and presumably evil Noble Scoundrels, who wish to eliminate us and catch up with us at the diner, seem perfectly content to wait around while we mess with a winch, explore the auto shop, and gather items to help us escape/fight them. How is this realistic? The HO scenes failed to include hidden objects, so they presented no challenge and weren't fun. The mini-games were the usual: copy the clue, guess the random order, match pairs, and move the crosshair to the target. No thinking required on the part of the gamer. And no thinking was required on the part of the developer either, as they just plugged in previous used programming, slapped on a new coat of paint, and claimed it was new. Sure, the production was state-of-the-art. This. Is. A. Game. It's not an animated movie. It's a GAME. While it's a bonus to have excellent production, the focus should be on the storyline and gameplay. Even the five-star reviewers are getting sick of the cookie cutters. BFG, most of us would gladly give up the "new game every day" in favor of one amazing, challenging, engaging, and fun game a week. No more cookie cutters! Rated 2 out of 5 by OliverSouth from This is not a 2 credit game This is not a 2 credit game way to short. Rated 2 out of 5 by campingramps from Eipix, what happened? Hidden Expedition series, at one time, was an automatic purchase because we knew everything about the game would be top notch but the past few have been drastic failures with this one being at the very bottom of the list. If I was head of Eipix I would have taken this concept and sent it back to the developers and tell them to earn their paycheck and make this a 5 star game. The ONLY reason I gave this 2 stars is because at least the graphics are still decent. This has become your typical back and forth, find things to open things, waste your time game with no logic whatsoever in the story line. I mean, c'mon, why does the agent have to clean a dirty engine just to take the head gasket and isn't there anything else in the shop to hold the hood open? very frustrating. I'm sorry, people, but please don't buy this just because of the 4 and 5 star ratings. Look at the 1 and 2 star ratings and play the weak demo before you decide. Needless to say, I can't recommend this game. Rated 2 out of 5 by KittyQueen from Hidden Who?? I have always loved playing the Hidden Expedition games. Because of that, I didn't hesitate in buying the CE release. You know the old saying "don't judge a book by its cover," Well, I did and got burned. Ten minutes in I was shaking my head. One minute you're in Honduras and all of a sudden you're in Montana. What? Too many puzzles and the game is really short. Not worth the price of a CE. Thankfully, it was 60% off. I do not recommend this game. If you really want it, wait for the standard edition and buy it when there is a big % off! Rated 2 out of 5 by Granny_Gruff from My Kingdom For a Bit of Logic!! My old partner, Sam, and I start out in the jungle, sent by H.E.L.P. to protect artifacts at a newly discovered ancient site. Things rapidly go south as we are fired upon and Sam urges me to run for it. I see what looks to be Sam's murder by one of the bad guys and I high tail it out of there. I show up next in Montana to help Agent Walker deal with a group called "The Noble Scoundrels." This entails washing an engine with degreaser, modifying a model car, and climbing a stack of old tires. I escape into town only to spend precious time finding a heart for a mime and then plunging into the train station to be ambushed. Good stuff: The artwork is well done. Bad stuff: My partner is killed and an ancient site compromised so I run?!? I decide to meet another agent in Montana on my own without checking with headquarters?!? I waste time cleaning an engine to get a part off of it to keep an old car hood up - why not use the rope I end up cutting off that stack of tires?!? And, as this was the first time I've ever been in this garage/junkyard, why would I climb on top of a falling-down garage to escape?!? Now that I'm running for my freedom, why would I stop to play with a mime?!? I go through the gate to the trains and I'm in a dead end hallway?!? So I didn't notice there were no tracks?!? Bottom line: I have twelve of the HE games and have enjoyed playing them, but this one has no discernable logic and not much else to recommend it. The early HE games were lengthy, full of content, and evolved as the genre advanced. Please try the demo before you buy. When we settle for short, unworthy games, we tell the Developers that they can play to the lowest common denominator. Don't let them win! Rated 2 out of 5 by cathybobcat from HELP....THIS IS ANOTHER SHORT AND PUZZLE HEAVY GAME Started out promising.....then went downhill FAST. You begin in the jungle of the Honduras with very atmospheric and defined graphics and from there you end up in a diner connected to a car repair garage area where you begin to perform one of too many mechanical tasks. I am not interested in being in a garage or junk yard pretending to be a mechanic....finding a power washer and nozzle along with grease remover to clean off an engine, nor dealing with jumper cables, car batteries and the like. I felt like taking a shower. Once again, we have story HOS where you have to find the items to match the words. There are also mini hos which are a complete turn off. Art work was decent in them, but there was one HOS that was so dark, I could hardly see to find the items needed, which was a very interactive HOS. It was in the store and was more like a puzzle than a hos. It even had puzzles in it, too....which you can skip...as all of them in this game. There are 36 signs to find that have an indicator in the lower right and a morphing object in the hos which also has an indicator in the lower right that glows and then there is a check mark when you find it. I think there are only 12 morphs which is the number of HOS listed in the Extras. No big deal for Extras. There are many technical and mechanical tasks in this that are more like a "guy thing" to do. Some of the tasks are ridiculous.....like running from 2 police officers in the garage while the officers just stand there like statues....yeah, sure. Then in the metro area, you scare the officers off with a loud clock chiming noise that distracts them. Who would want that kind of security? Are they serious? One of the most annoying things in this is the clanging noise that you will hear every time you click on your mouse to place an item, which has to be placed exactly right or you just keep hearing the irritating noise until the item is placed correctly. I kept trying to place items that I was putting in the right place because I used a hint that directed me to the exact place I was trying to put it. You know how it is when you are experimenting with what item goes where. The noise every time I clicked was extremely distracting and I had to mute the Effects volume in the Options so I wouldn't have to listen to it anymore. Then when you do that, you can't hear any of the environmental effects and it takes away from the gameplay. I have found this to be common in many games. This is also puzzle heavy. Puzzles always outnumber the HOS....and although it is indicated you can replay both, there are more puzzles in the game than they give you for replay. Isn't that always the way? You can always bet there are more puzzles in a game than what you can replay. I doubt that puzzle enthusiasts will be impressed with them, anyway. I wouldn't care to replay anything in this. Graphics and story were decent, as well as some of the HOS. Because of the gameplay, I lost interest. This is an unforgiveable short game and should have been much longer. It is definitely not worthy of a CE price. Rated 1 out of 5 by nadaze2da from Here's another game to throw on the reject pile Review from Demo I've never been much of a fan of the Hidden Expedition series, but a couple of them have been pretty good. This one however follows the trend lately to churn out one game after another that has no logic and has deteriorated into going back and forth to find one key to open a lock which conceals another key to a lock which contains an amulet that opens something else. There is just too much lately of the same thing over and over in every single game, not just the HE series. After a gang attack in the jungles of the Amazon, Sam is believed dead since we saw it with our own eyes (he usually just disappears and we don't know if he's dead or not). We don't waste much time mourning over the loss of Sam the super agent sidekick however and we must rush to Montana! In a junkyard there, we wind up chased by fake police but must take the time to stack tires to get on the roof of a dilapidated garage and run. Very slow police. Then we take time to find the mime's heart then discover we ran into an ambush at the train station. There is nothing about this game to recommend it as a game to buy unless all you want for your money is collectibles and some good graphics . It is a pitiful attempt at a HOPA and very lackluster. Puzzles and HOs are easy and mediocre at best. I don't understand 5 star reviews for this game. There is no way I would purchase it or recommend it. Try the demo but be forewarned that it is boring and tedious. Rated 1 out of 5 by CaroJ11 from Tedious game Top quality graphics. However, players should not be fooled thinking this game all takes place in the jungle. Most scenes take place in a diner, a garage, a barbershop, a dead end street, HELP headquarters. Very little mystery. The storyline is clumsy and the game itself way, way too short. I found the puzzles occasionally confusing, but they can all be skipped. Overall, I found far too much techie action in the game and far too little rainforest mystery. Two credits wasted on this tiresome game. Rated 1 out of 5 by nuttynita from Boring Very slow in story telling, mini games boring no challenge, didn't hold my attention for a minute. Not a game I would buy. Could only play for 15 minutes and that was 10 minutes to long. Not one of your best games. Graphics not good. Rated 1 out of 5 by biscuitsmama from SURELY IN THIS HIDDEN EXPEDITION THERE MUST BE SOMETHING GOOD TO FIND Hidden Expedition Altar of Lies is an appropriate title for this game as it turns out. After playing through the tedious and ridiculous demo, I still purchased the game hoping that it would get better since it ended on a cliff-hanger. Once I downloaded the full content I was left wondering why on earth I felt it would get better since the demo was so boring. I guess that cliff-hanger will grab me all the time. However, after trying to escape capture by the crooked and notorious gang of criminals named the Noble Scoundrels and racing to save my hide I next go off on a rather silly task to return a missing heart to a street mime; a task that requires me to waste time playing a sort of Rube-Goldberg puzzle/HOP scene to find the mime’s heart. Next I race into the subway station only to confront my partner who I presumed to be dead after his fall from a cliff in the clutches of a thug associated with the “Noble Scoundrels”. It was at this point I decided that the name of the game Altar of Lies is perfect as half the storyline is missing and is presumably left on the cutting room floor for this developer as they pared down the game to fit the now requisite three or four chapters per game. 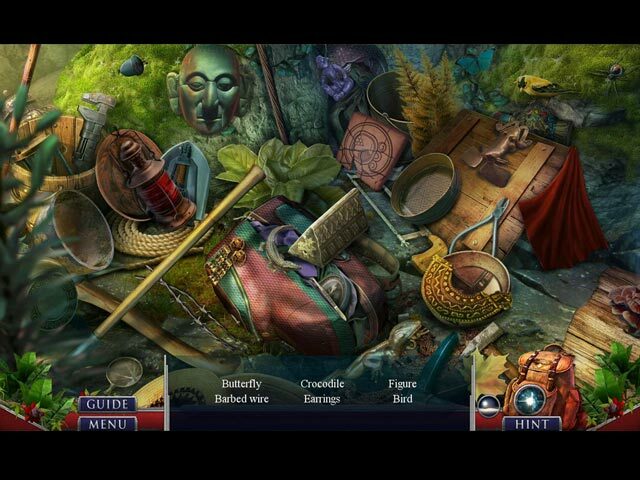 It is games like this Hidden Expedition that result in more and more gamers losing interest in HOPA games. After all, many of us have been around for a while and have cut our gaming teeth on terrific games that were created by very capable, talented, and overall excellent game developers. If you now were offered games that had half the content of those wonderful games of yesteryear, wouldn’t you lose interest? It wouldn’t be so bad if the games were not padded out by cut scenes and time-filler puzzles. I would, quite frankly, not mind a shorter game if it had an excellent and sensible storyline along with great HOPS and tasks to complete. Yes, many of us are tired of the same old missing zipper pulls and broken glass knives that seem to pop up in every game that we find. What happened to the creative imagination of these world class developers? Hidden Expedition Altar of Lies is the result of offering almost daily sales – something that never happened in the good old days. Don’t get me wrong, almost everyone loves a sale myself included, BUT if I found a wonderful game full of creativity that definitely took longer than two hours to complete I would gladly pay full price for that game. As it is now, the standard edition of a new HOPA game is release within a couple of weeks from the CE version that many gamers will now wait to purchase the game – again with one of those almost daily sales. I long for an honest and terrific game but Altar of Lies is definitely not a game that I have found exciting or enjoyable. As I mentioned I purchased the game but found it plodding, nonsensical and definitely not a Hidden Expedition caliber game. I think it is time for Big Fish to take a look at what it is offering to its customer base and provide quality over quantity. They might be surprised to see its bottom line begin to grow as gamers come back to experience great quality games once again. Even though I was left rather disenchanted by Altar of Lies, please try the demo because you certainly might see something I didn’t. Happy gaming!